You have the ability to share your workspace with members of your organization/team, and to control their level of access to the workspace. 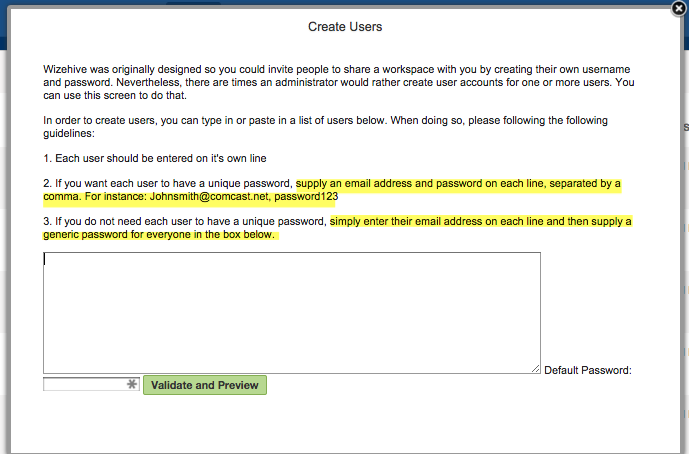 Below is outlined how to add members to your workspace. If you do not see the People tab active in your workspace, go to Manage Tabs in order to do so. 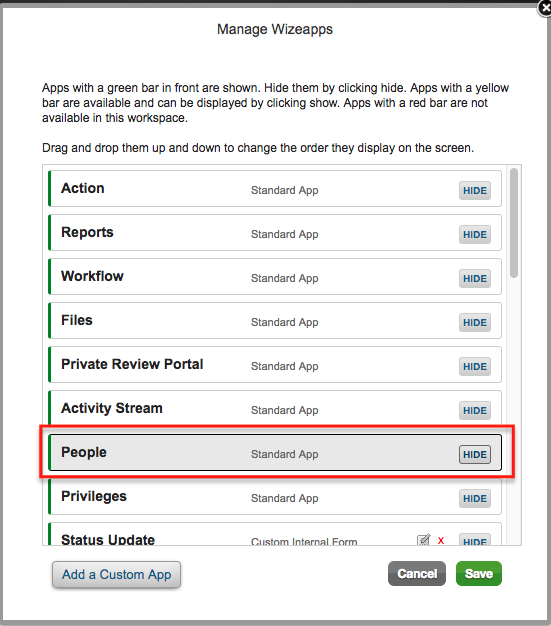 Find the People row and click Show, and then Save, in order to activate this feature. Go to the People Tab of your workspace. You will see this default screen, a list of everyone currently in your workspace. On the following screen, click you will be presented with three options. It is strongly recommended to choose the third option, Create an account for them. 1. The first two options involve an invitation to be sent which puts more pressure on the member being added where they are now responsible for creating their own account. 2. Because the first two options involve a WizeHive ­generated email, sometimes these emails get automatically filtered into SPAM or are blocked by internal company settings. This makes it difficult/impossible to ensure users will actually get added to the workspace and can cause a headache for both the user being added and the administrator responsible for getting them in the workspace. Follow the instructions on the screen to list the emails of all your new workspace members. You will see that there are two password options: (a) you can create a password for each user; or (b) you can set a default password that applies to all users. Step 2 of the instructions outlines how to create a unique password. Step 3 outlines how to set a default password. Your list should look something like this, if creating unique passwords. Your list will look like this, if creating a default password. 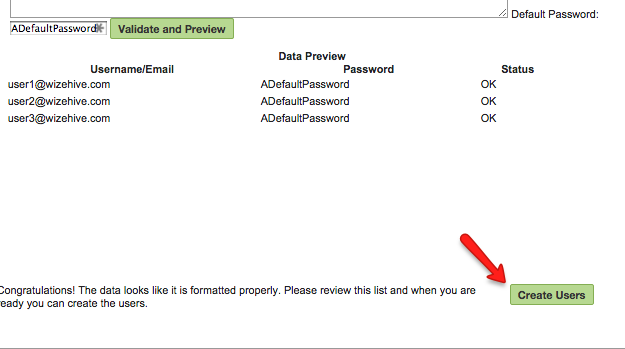 To correct this, you can simply edit the emails in the boxes above and press Validate and Preview again. 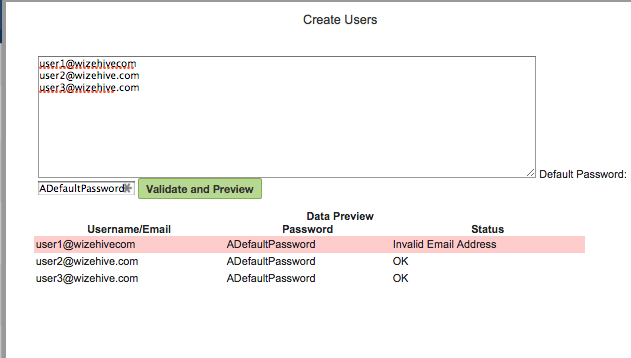 Once you have validated and no longer find errors, press Create Users. 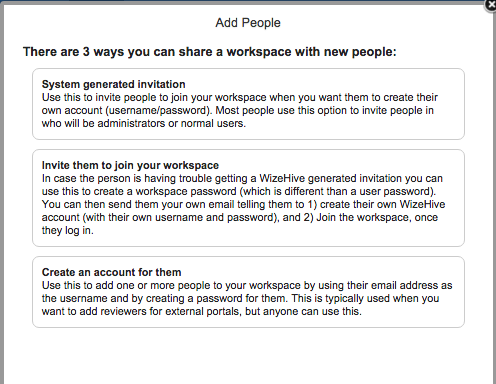 This will add your users to the workspace. By default, your users are added as Limited Users. You can learn more about user types here. If you would like to change your users to a different status, you can click Limited User in the status column and select from the dropdown menu provided.